So, as usual, I was in the middle of writing a blog which is now going to be set aside in favor of this one. I’d wanted to post a listicle recounting last year’s activity at my blog. I really wanted to post it either on New Years Eve or New Years Day, but as is often the case other things took priority. Given that I and my blog were mentioned in the New York Times (online edition here and in the print edition today) I figured I’d do that post now. 2013 was a good year for the blog, and while I haven’t done nearly as much commenting on other online venues as I might have done in past years, I have probably posted more content last year than in any other. Some of those posts have gotten me quite a bit of recognition from other cultural bloggers. I won’t make a tedious list of all those, but will highlight some. The most traffic I’ve gotten was after Alex Ross (music critic of the New Yorker magazine) mentioned a few of my posts that outlined the classical music crisis as it appeared in the press. His post The orchestra crisis at 110 and The opera crisis at 332 which both link here were pleasant surprises when I happened to be checking my stats and wondering where the heck all this new traffic was coming from. Jon maintains excellent listing resource pages and covers groups via his Diversity category of posts. And when it comes to this topic, he knows his stuff; so much so that he has no trouble taking one of the usual talking head suspects in the culture blogging community to task for what he calls inane observations about the genre. Another series of posts I’d been working on deals with the role the WPA had in developing and sustaining Symphony Orchestras during the Great Depression in the US–both Joe and Drew linked and commented and the former had some interesting insights of his own. which just makes me wonder how much of my thoughts have appeared in traditional print–if this book hadn’t been digitized by Google Books, I might never had known about my tiny contribution. Oh, here’s the blog post Barker is referencing for those interested: The Death of the Cinematic Industry…. Of course, the main reason to do this post is to thank each and every one of the folks above and all my readers for all the interaction and stimulating discussions–I look forward to another great year of reading and blogging! Since I get to do so many activities that most people wouldn’t associate with the cello and being a cellist, I thought it would make more sense to feature that stuff there. I’ll leave my various cello related series/posts at this blog for now, but future will be at the Bold Cellist tumblr blog! 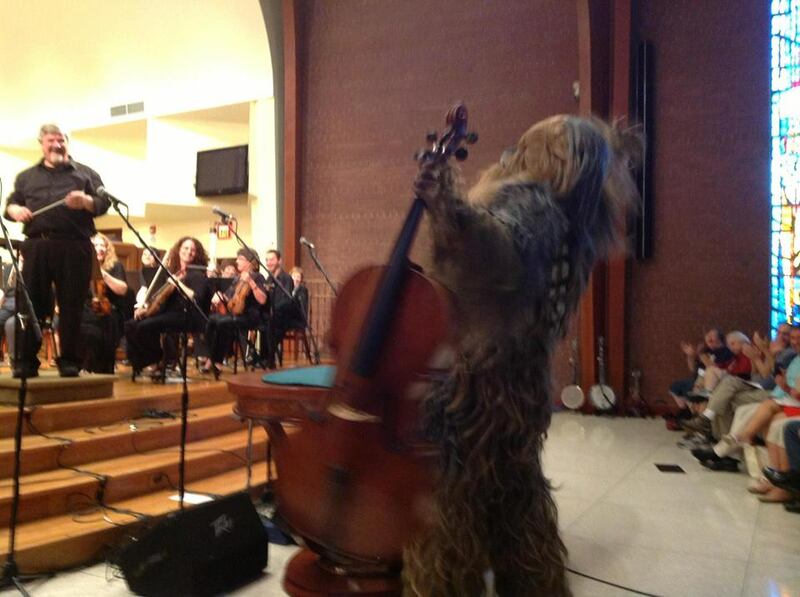 With that, I leave you this image of me being a Wookiee Cellist at a recent orchestra concert! Jon Silpayamanant as a Wookiee Cellist at a recent Louisville Philharmonia Pops Concert. Hope to see some of you folks over there! End of the year reflections and the coming new year! Happy New Year, folks and I hope you had a great holiday break (if you had one). It’s been over a year since I’ve sent you a message and that one was a rather bleak one, as I recall (due to the death of my brother, Joe). But I couldn’t resist sending out an email with the Subject line: “Yo-Yo Ma, Klingons and Central Asia!” And, well, that just about sums up the last quarter of my year (2011). This is one of those epic sub lines that becomes the stuff of legends like the baconcat. Though the reality of it is just a little bit less awesome (well, maybe for you folks, but for me–NO!) because sadly the three things mentioned don’t have anything to do with each other (other than how I overlap them). Most of the hits an be grouped into related phrases even I might only have one or two hits per phrase. For example, I’ve gotten two dozen or more combinations of phrases with “Klingon” or “Klingon Women” or “Klingon Costume” which is understandable as I occasionally talk about my Klingon music projects and band. I’m not entirely sure what the person using the search phrase “star wars klingon costume” was looking for, but I hope he or she found it here. I’ve got way too much on my mind and to do by the end of this coming week so my blog topics may not be incredibly heavy affairs but I hope to come back to the issues of local music economics and the elephant in the room issue I mentioned in the previous post. I just wanted to throw out a couple of blogs I’ve been reading regularly lately. The first is Profuse and Various: Thoughts on music, teaching, and whatever else happens to strike me. The author, Jazzman, has some fascinating takes on music education and, like me, being relatively new to the field the takes are refreshing! He’s also asked some important and penetrating questions about some of the things I’ve posted here which is very helpful as a writer–knowing how clear I haven’t been, or just what things need more elaboration is always a good thing, IMO! The other blog is by Bryan Townsend – The Music Salon who I discovered as he’s recently been posting quite often to Greg Sandow’s blog (with an updated look to boot!). Bryan is unapologetic about Classical music while also understanding that there are significant factors which are shaping the decline of audiences (not the decline of Classical Music!). I’m still reading (and re-reading) a number of his past posts and adding to the queue of ‘things to process‘ so it may take some time for me to find anything halfway intelligent to say about them, but there are a number of issues he’s brought up that complement many of the things I’ve posted about here. And yes, I know my ‘blogroll’ is a mess and hope to get the different categories cleared up. This new template is cleaner, but I’m not so sure it was as user friendly to navigate as the previous. Until I have some time, it will stay as it is.